Occupational safety and health professionals have become increasingly concerned with the development of Cumulative Trauma Disorders (CTDs) in workers performing hand-intensive jobs. 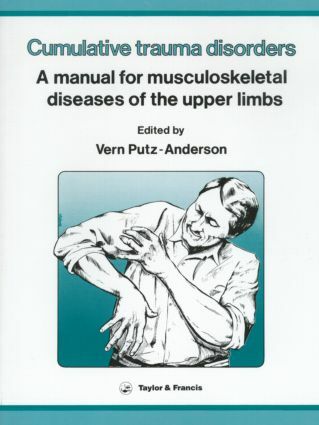 These disorders, which primarily affect the soft tissues of the musculoskeletal system, are associated with repeated or sustained exertions in awkward or static postures, or with a high concentration of stress in the upper extremities. Research conducted at various worksites over the last few years confirmed earlier observations that attributed many of the CTDs to improperly designed work surfaces and/or improper selection of tools that place excessive stress on the tendons, muscles and nerves. In an occupational setting, the recommended intervention is to modify or redesign the job or tool to minimise the sources of biomechanical trauma. Based on the theory that work-related trauma is the principle casual factor, such action should result in a reduced incident of occupational musculoskeletal disorders. The information contained within this manual will help health professionals, workers and employers be more cognizant of the types of work patterns that have potential to cause various CTDs and be aware of the ergonomic interventions that can be adopted to reduce these problems in the workplace.